By Virginia T. McLemore and William L. Chenoweth, scale 1:1,000,000. The most important host rock that contains the most economic uranium deposits in New Mexico is sandstone within the Morrison Formation (Jurassic) in the Grants and Shiprock uranium districts, San Juan Basin. More than 336 million lbs of U3O8 have been produced from these uranium deposits from 1948 through 1988, accounting for 97% of the total uranium production in New Mexico and 38% of the total uranium production in the United States. Sandstone in the Morrison continues to have the most economic reserves and potential resources in New Mexico. Uranium deposits also occur in sandstone beds of Pennsylvanian, Permian, Triassic, Cretaceous, Tertiary, and Quaternary formations. Although only 468,680 lbs of U3O8 or 0.14% of the total uranium production in New Mexico have been produced from these deposits, some sandstone beds may have high potential resources. In contrast, almost 6.7 million lbs of U3O8 have been produced from uranium deposits in limestone beds of the Todilto Limestone Member of the Wanakah Formation (Jurassic) in the Grants uranium district, accounting for almost 2% of the total uranium production in New Mexico. However, limestone uranium deposits probably will not be mined in the near future because they are small in size and sporadic in distribution and are difficult to locate. Other uranium deposits in New Mexico are hosted by other sedimentary rocks or are found in fracture-controlled veins or igneous and metamorphic rocks. Production from these deposits has been insignificant (less than 0.08% of the total uranium production in New Mexico}, but there may be potential for medium- to high-grade, medium-sized uranium deposits in some areas. 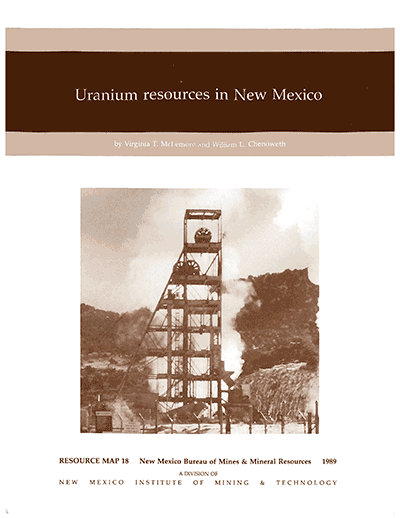 New Mexico has significant uranium reserves and potential resources. Future development of these reserves and resources will depend upon an increase in price for uranium and the lowering of production costs, perhaps by in-situ leaching techniques.